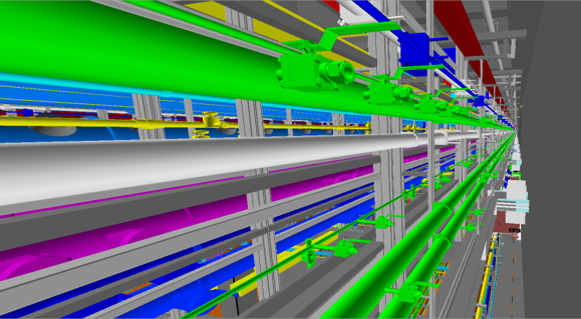 With recent advancements in CAD and BIM technologies, it's possible to design a structure or facility with an amazing level of detail. Level-of-Design where all aspects of the mechanical, electrical, and plumbing (MEP) systems can be precisely traced, mapped, and inventoried. This opens the door for modularization concepts to be applied to MEP design. As with prefabricated structures, modular MEP systems take advantage of the high degree of precision provided by BIM tools to meet the exact requirements of each situation and achieve a buildable design every time. This means modular MEPs can be manufactured off-site by trained professionals, then shipped and installed with complete confidence that the modules can be joined as designed. This consolidates and transfers a tremendous amount of assembly, welding, time and man-power off-site. Moreover, this method allows the modular MEP system to be procured and constructed on a parallel-path schedule as the facility to which it will be installed. There is no need to wait since both can be done simultaneously. Lean construction was born by adapting the lean manufacturing principles first developed by Toyota in the 1990's to fit the construction world . Reducing waste, time and cost are some of the key objectives and advantages of this methodology. All of these are applicable to modular MEP systems as much as they are to broader Lean Construction initiatives. Waste is reduced by using pre-selected materials in modular design. Time is optimized by using an off-site facility where experienced engineers focus solely on the Modular MEP requirements and materials. Cost is lowered by allowing the client to focus its resources on other factors, decreasing installation time and optimizing the use of materials. Due to the natural complexity of modern structures and buildings, it is virtually impossible to manufacture a standardized or scalable MEP system that could be applied to every scenario; there are too many variables and particularities for each application. This is where BIM Revit technology truly shines. It enables modular design, planning, and production of highly complex and unique systems, taking you from point A (project kick-off) to point B (the installed MEP) in the most efficient manner available. To learn more about the modularization of utility dense systems and facilities, please feel free to access the large-scale modularization fact sheet from our trusted partner, NEHP, below.